At the end of the nineteenth century, an international conference took place sponsored by the Zionist Organisation that was dedicated to the problem of the future national language of the Jewish state. A heated debate was held and the question put to vote: Hebrew won out only by several votes over German to become the national language. As absurd as it might seem, the language of Goethe nearly became the official spoken tongue of Israel. Between the end of the nineteenth century and the present day, there is a distinct “before” and “after”, a period the Jews call Shoah and the German the Holocaust. Why was this tragedy conceived, organised, and put into action in Germany of all places ? The very country known for its level of civilised culture, fatherland of poets and thinkers ? Between 1870 and 1914, Germany served as a refuge (France had come under suspicion because of the Dreyfus Affair) for a considerable number of Jews expelled from Russia, Poland, and Ukraine by the miserable conditions and pogroms that regularly bloodied the shtetlach. Born in Russia in 1885, Nahum Goldmann, the founding father of the World Jewish Congress, came to Frankfurt am Main at the age of five. He explained in his memoirs that it was natural for him, a Jew and Zionist, to enter into the services of the propaganda machine of Kaiser Wilhem II. At the time he thought, “The great power of anti-semitism was in the hands of czarist Russia, and the victory of Germany seemed to me a good thing for the emancipation of Jews oppressed in the east in Poland, Lithuania, and other territories arbitrarily forced to submit to Russian governance”. A half century later the same Nahum Goldmann would negotiate with Konrad Adenauer the sum of reparations to be paid to the survivors of Hitler’s genocide and to the new state of Israel by a Germany in ruins after the war. The synagogue of Worms in the Palatinate alone can serve as a symbol of the history of Germany and its Jews. Founded in 1034, the synagogue of Worms is one of the oldest in Europe. It was built by the same architects and craftsmen as the Romanesque cathedral of the city. Seven times destroyed and rebuilt, it was dynamited and razed during the violence of Kristallnacht on 9 November 1938, unleashing the anti-semitic violence of Hitler’s regime. Reconstructed after the war, it now serves as a place of worship for Jewish soldiers from the neighbouring American military base because there are no longer enough Jews in Worms to make up a minyan. According to certain tales, the Jewish presence in Worms dates back to the first destruction of the Temple of Jerusalem in 587 B.C.E. and the Jews’ refusal to respond to the call of the prophet Ezra to return to their land at the end of the Babylonian exile. Other stories suggest the first Jews landed on the banks of the Rhine with Marcellinus, a Roman officer who participated in the conquest of Jerusalem in 70 C.E. Hence, in the Middle Ages the Duisberg family simultaneously claimed to have directly descended from Marcellinus and demanded from the city the right to protect Jews and thus enjoy the comfortable revenues this privilege garnered. As in all of Christian Europe, the Jews of Germany have known alternating periods of tolerance and more or less harmonious existence with Christians (tolerance most often in periods of relative economic prosperity) and oppression, persecution, and expulsion. Yet the Jews had always seen this country as the Ashkenazi, or the Promised Land (Genesis 10), from which comes the general name for Jews of Central and Eastern Europe, Ashkenazim. The arrival of the first Jews in Germany was made the subject of several legendary tales. Leo Trepp, the honorary rabbi of Mainz and the author of A History of the German Jews, notes with sagacity that “certainly, legend can not replace history, but history should not be in total contradiction with legend, lest history itself be rejected. Insofar as we are concerned, it means that we firmly believe in the settling of Jews in Germany dating back to ancient times.” The first written mention of a Jewish presence in present-day Germany is contained in a edict signed by Emperor Constantine dating from 321 C.E. that requests the Jews of Cologne (Colonia Agrippina) to send “two or three members” of their community to the city’s curia (government). This was not really the privilege that it might seem to be: the magistrates were responsible for Roman tax collection and often had to pay the emperor themselves when the populace was too poor or rebellious to be taxed. This edict indicates that by this period the community of Rhenish Jews had acquired a certain economic comfort. This situation continued after the fall of the Roman Empire. The new masters of the country, the lords and bishops coming from the Germanic tribes, maintained cordial relations with the Jews. But there was some tension, since the papacy saw in Judaism a rival with Christianity. The Emperor, claiming the heritage of his Roman predecessors, saw himself as the protector of the Jews and the guarantor of a prosperity from which he could take his share. This situation irritated a portion of the clergy. Agobard, bishop of Lyon in the ninth century, complained bitterly that the Jews in his diocese has acquired too much influence under imperial protection: the nobles more often sought the blessings of the rabbis than the bishop, and Jewish merchants had succeeded in moving the weekly market from Saturday to Sunday. In the cities, Jews increasingly confronted hostility from Christian artisans’ guilds. Excluded from membership in most guilds, Jews devoted themselves to commerce and trade, notably with the Muslim Orient, taking advantage of their relations with Jewish communities settled in those regions. The scarcity of currency in the west and the ban on Christian lending money with interest pushed Jews towards this activity. In the course of the ninth century, the prosperous Jewish communities of Speyer, Mainz, and Worms maintained excellent relations with the local (notably ecclesiastical) authorities. For example, in 1096, the archbishop of Speyer invited Jews persecuted elsewhere to settle in his city because their presence, he affirmed, “considerably increases the prestige of the city.” The religious and cultural life of these communities flourished: numerous synagogues were erected, “sages” such as Gershom ben Yehuda and Salomon ben Isaac, known as Rashi, moved there to give teachings on religion and law that still have authority today. The beginning of the Crusades in 1096 and the gradual hardening of the Church toward the Jews during the Third and Fourth Lateran Councils (1179 and 1215) finally put an end to peaceful coexistence. In the wake of the first Crusades, non-Christians encountered on the way were put to the sword by bands of religious fanatics, landless peasants, and adventurers en route to Jerusalem. Despite the warnings given by Jews in France who had already experienced murderous assaults from these armed bands, notably in Rouen, the leaders of the Rhenish communities thought the protection of the princes and bishops constituted a sufficient deterrent. This was indeed the case in Speyer, where the Jews and the troops of Bishop Johannes I succeeded in pushing back the assailants. In contrast, the authorities and townspeople of Worms and Mainz did nothing to stop the massacres. Pursued of contained in ghettos as a result of increasingly severe discriminatory practices imposed by the Pope, the German Jews generally did not escape the destinies of fellow Jews meted out by Christians in the rest of Europe. At regular intervals in history, accusations that Jews performed ritual murders provoked pogroms and expulsions that conveniently settled outstanding debts owed to Jewish lenders. These persecutions drove numerous German Jews east toward Poland, where the sovereigns were more kindly disposed toward them and likely to welcome Jews in order to take advantage of their skills as merchants and bankers. Thus Yiddish, a mixture of Middle High German dialect and Hebrew syntax, was preserved in eastern Europe until these communities disappeared, victims of the Shoah. The annals of Jewish history from the Roman Empire to the Wars of Religion reveal periods of relative tolerance alternating with episodes of extreme anti-Jewish violence. On the whole tolerance for the Jewish faith was scattered and disparate, occurring wherever a local prince declared himself “protector of the Jews” out of what was essentially self-interest. Theses periods of calm were preferred, however, to the acts of violence that sometimes broke out. In 1298, for example, 140 Jewish communities in Franconia and Saxony were annihilated in the space of six months by the hordes under the command of Chevalier Rindfleisch. Led my Martin Luther, the Reformation provoked upheaval in the Holy Roman Empire that did nothing to improve the well-being of the Jews there. Luther had first hoped to convert them by treating them with kindness and understanding. He thus protested in 1523 against the unfair treatment inflicted on them and noted that, “if the Apostles, who were Jews themselves, had behaved this way toward other pagans, not a single one among them would have become Christians.” Twenty years later, profoundly disappointed with the minimal impact he had in converting the Jews to the reformed faith, Luther gave free rein to his anti-Jewish hatred. In this infamous writing, Luther suggests a policy of “though love” toward the Jews: “burn their school and synagogues…, destroy their homes and make them understand that, like the Gypsies, they are not in their own land…, destroy all their books, [forbid] their rabbis to preach their heresies, so that we follow the sensible example of other nations like France, Spain, and Bohemia, which have always excluded Jews from their territories.” For four centuries theses imprecations justified popular anti-Semitism in Germany, despite efforts by numerous Protestant theologians and pastors to distance themselves from this interpretation of the great reformer’s text. In this precarious situation, the Jewish communities of Germany owed their survival to the presence and ability of “courtly Jews” whom German princes, ever lacking in funds, needed in order to maintain their standards of living or to finance military campaigns. It was this in this capacity that Samuel Oppenheimer gathered the means necessary to defend Vienna against the Turks, and how Joseph Süsskind Oppenheimer (1692-1738), known as “the Jewish Süss”, became the chief adviser of Duke Charles Alexander of Wüttemberg. The favor of princes permitted Jews of the courts to obtain dispensations for their fellow believers, privileges often quickly reconsidered as soon as dynastic succession was at issue. At the end of the seventeenth century, the Jews living in the Hapsburg Empire numbered approximately 60000 of a total of 40 million inhabitants. The largest Jewish community, with a population of 3000, was in Frankfurt. The process that granted German Jews citizenship and enabled them to leave the ghettos was a long one, begun at the end of the seventeenth century and reaching its apogee after 1871, under Wilhelm I. The dawning of the Aufklärung, the German equivalent of the French Enlightenment, contributed to the secularisation of the Jewish community. Despite the restrictions of Jews’ civil rights in effect in the majority of German states, under Frederick Wilhelm I, and especially Frederick the Great (Frederick II), Prussia welcomed rich Jewish families banished from Austria in the same way that it had opened its doors to the French Huguenots ejected from their country after the revocation of the Edict of Nantes. Moses Mendelssohn (1729-86) emerged in Berlin as a great figure in German Judaism. 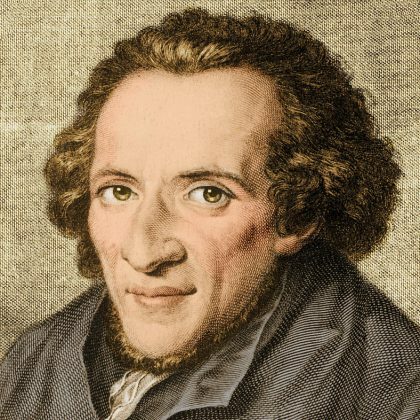 The founder of Haskalah, a contemporary method of of practicing the faith, Mendelssohn helped the Jews leave both the literal and spiritual confinement of the ghettos. Ignoring the criticism of Orthodox rabbis, he translated the Torah into German and encouraged Jews to use this language in their intellectual exchanges with scholars of other religions in order to dissipate misunderstandings of Judaism in caricatures and in Judeo-phobic polemics. This current of thought opened the way to the massive secularisation of German Jews, often manifesting itself as conversion to Christianity, the “admission ticket” required for entry into the ruling class. The victory of the armies of the French Republic, and then the Napoleonic Empire, brought the Jews of Germany the legal emancipation established in France by the laws of 1791 and 1807. In a vanquished Prussia, Chancellor Hardenberg, busy preparing his revenge, thought it an opportune moment to rally the Jews to his cause by granting them full citizenship in 1812. In return, the vast majority of German Jews made a show of their patriotism in the exalted Wars of Liberation of 1813-15. Heinrich Heine (1797-1856), born in Düsseldorf, and Karl Marx, born in Trier, are the two most famous representatives of the wave of more or less sincere conversion to Christianity among members of the Jewish bourgeoisie for whom baptism constituted the “admission ticket” into high society. Their respective attitudes toward the religion of their forefathers are, however, completely opposite. For Heine, conversion changed nothing. The great German poet originally explained this in French, noting, “One doesn’t change religions. One leaves one of them that one no longer has for another that one will never have. I am baptised, but I am not converted”. In contrast Marx, baptised at the age of six, declared: “the earthly foundation of Judaism which conditions the Jews’ life here on earth is egotism. His religion is merely a lip service, and his god money”. The childhood homes of Heine in Düsseldorf and Marx in Trier have been turned into museums. Despite the persistent anti-Semitism across all strata of society, the Jews persisted in their undivided loyalty toward their German homeland until it became evident that, with Hitler’s rise to power, the Jewish-German symbiosis was destined to come to a tragic end. In 1871, Germany counted 512153 Jews among its citizens (1,25 % of the population); in 1933 they numbered a similar 502773 (0,76 % of the population) and represented the third largest Jewish community in Europe after Poland and Russia. Their economic, intellectual, and cultural influence on German society was relative to their demographic presence. Figuring in the ranks of legendary businessmen are great bankers such as the Rothschilds, the Warburgs, the Bleichröders, and others, industrialists like the chemist Heinrich Caro, cofounder of IGFarben, and weapons contractors such as Alfred Ballin, president of HAPAG, the most important maritime company in Germany. German Jews are among the founders of department stores (Hermann Tietze, Wertheim) that have left their mark on retail and whose signs are still to be found in German cities. Likewise, many significant contributions to the sciences and culture were made by celebrated Jews: Albert Einstein, Robert Oppenheimer, Hermann Cohen, Hannah Arendt, Alfred Döblin, Lion Feuchtwanger, Arnold Schönberg, Max Reinhardt, Fritz Lang, Billy Wilder -among many others who came from the cultural world of German Jews, a spirit that lives on in many other places, brought there by those who could escape Hitler’s extermination plans. 1 January: Jews are excluded from the Red Cross. 25 July: Jewish doctors are no longer allowed to practice medicine. 17 August: Jews are required to add the name “Israel” or “Sara” to their official papers. 27 September: Jewish lawyers are labeled “forbidden professionals”. 8 October: Jewish passports are required to be stamped with the letter “J”. 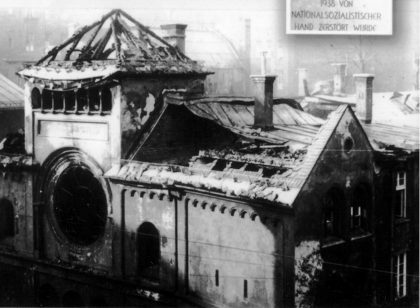 9 and 10 October: Kristallnacht. At the instigation of the Gestapo, armed bands plunder and damage Jewish synagogues, institutions, and shops. 15 November: Jewish children are excluded from public schools. 3 December: Jews are forbidden to go to cinemas, theatres, museums, and sporting events; drivers’ licenses belonging to Jews are cancelled. 8 December: Jews are excluded from universities. Today, the Jewish community in Germany numbers some 100000 members. For many years this population has comprised Jews who survived the concentration camps and had nowhere else to go, or Jews who fled into exile but returned to Germany out of nostalgia. With the arrival of Jews from the former Communist countries in the last decade of the twentieth century, however, the population has abruptly grown. In welcoming them, the new and reunified Germany wishes to demonstrate that the country assumes full responsibility for its history. The same concern pushed the country’s authorities to preserve what remained of the Jewish heritage after the destruction wrought by the Nazis. In that regard, Germany is paradoxically the European country where one finds the largest number of Jewish memorials, safeguarded at the initiative of officials in the larger cities and thanks to the action of persons or associations that have wrestled with the tendency to forget the Jewish heritage in towns and villages. The scope of the present guide does not permit an exhaustive listing of these sites. In general, municipalities with tourist infirmation offices will willingly furnish all the information necessary to visit them.